Credit cards are ubiquitous in American society. We get offers to take out a new credit card when we turn eighteen, prisoners get offers to take out credit cards while they are still in jail, and even the recently deceased still get offers to take out a credit card well after the day they died. It is obvious that credit card companies don’t pay much attention to whom they are loaning money to, and therefore have no idea whether they’ll get paid back. So how do they make money? The answer lies in the magic of compound interest. Most of Lawrence & Associates’ bankruptcy clients never think about the massive amount of money they will put toward compound interest in their lives. Many schools don’t teach students how to manage their finances, and many parents don’t learn these lessons through life experience in time to pass them on to their children. For the poor and middle class, a multi-generational cycle of dependence on debt is now in full swing, where grandparents were sold on an idea that the American Dream is fueled by debt, and their grandchildren already have more debt – starting with student loans – than they can pay off in their working lives. Some debts are necessary; almost no one can buy a home without financing a large part of the purchase. And some debts are smart; it can be a good idea to take out a low interest SBA loan for the purpose of financing a well-planned business venture. But many debts are neither necessary nor smart, and this brings us back to credit cards. It is important for anyone anticipating a credit card purchase to understand the effect that compound interest will have on their purchase. Unfortunately, a shockingly small minority of people know how to calculate compound interest. The numbers are staggering once you take a look at this. This article shows how an average credit card debt of $15,956, with the average credit card interest rate of 12.83%, results in the credit card company making a whopping $2,629,628.64 off of you in interest between ages 25 and 65. Again, that is over two-and-a-half million dollars in interest on a balance under $16,000!!! Is it any wonder 819,240 Americans filed bankruptcy in 2015? Despite that huge number of filings, the credit card industry rakes in billions of dollars every year. As shown by the example above, the interest they charge is so astronomical that the credit card industries are mathematically certain to make tremendous amounts of money even if a large number of the people they lend to file bankruptcy or otherwise don’t pay them back. This is why credit card companies don’t bother checking a person’s credit score, or even whether they are still alive, before sending them a credit card offer. It is a volume industry, and the more money they lend the more they are likely to make. What Can You Do If You Have Crippling Credit Card Debt? Given all we’ve said above, a large percentage of the people reading this article are statistically likely to be in credit card debt that they have no hope of paying off. How can they get a fresh start and return to financial stability? There are many ways, but the surest way is to file bankruptcy on the credit card debt. A Chapter 7 bankruptcy wipes out credit card debt completely. A Chapter 13 bankruptcy requires you to make payments toward credit card debt, although often the debtor pays only pennies on the dollar. In either event, the debtor – who has probably paid off the original debt many times over – saves a large amount of money on credit card interest. Bankruptcy has other benefits as well. All running interest on credit card debt must stop. All lawsuits must stop. Collection calls must stop. In a bankruptcy, for the first time, the debtor has all the muscle and all the power. Credit card companies must follow laws that are favorable to the debtor, rather than the laws that are typically more favorable to the creditor. If you think you may need to file bankruptcy on credit card debt, call our attorneys for a free consultation. We’ll let you know if bankruptcy is right for you, and if so, what kind of bankruptcy you should file. 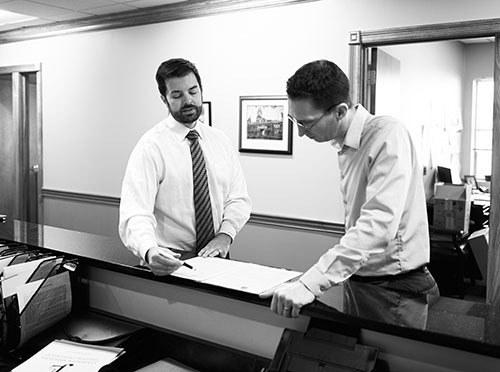 There is no obligation to a consultation, and our friendly staff will make you feel at ease. We are working hard for the working class, and we can help you!